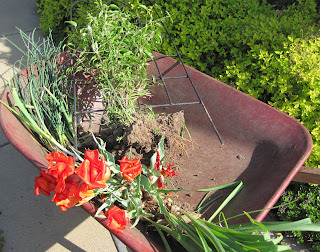 In preparation for the implementation of the new garden design, I am moving plants. For many gardeners, "moving plants" is a scary thing to consider. When should I move them? Where should I move them? Can I move them? Should I divide them when I move them? What if I kill the plants by moving them? When should you move plants? Ideally, you should move plants when there are not extremes of temperature, such as on really hot days, or when the ground is frozen. I like to move plants in early spring before they get too big, but some plants like peonies and irises do better if moved in the fall. If you decide to move plants in the fall, be sure to do it early enough to give the plants time to establish some roots before the ground freezes. The other time to move plants is when you have to move them, such as right before the garden designer is going to show up and tell the crew where to dig and plant new plants. Where should I move them? Presumably you are moving plants because they need to be moved and not because you just can’t make up your mind on where to plant them. Move plants to locations that will give them room to grow and provide the kind of conditions (light, water, soil type) that they will do well in. 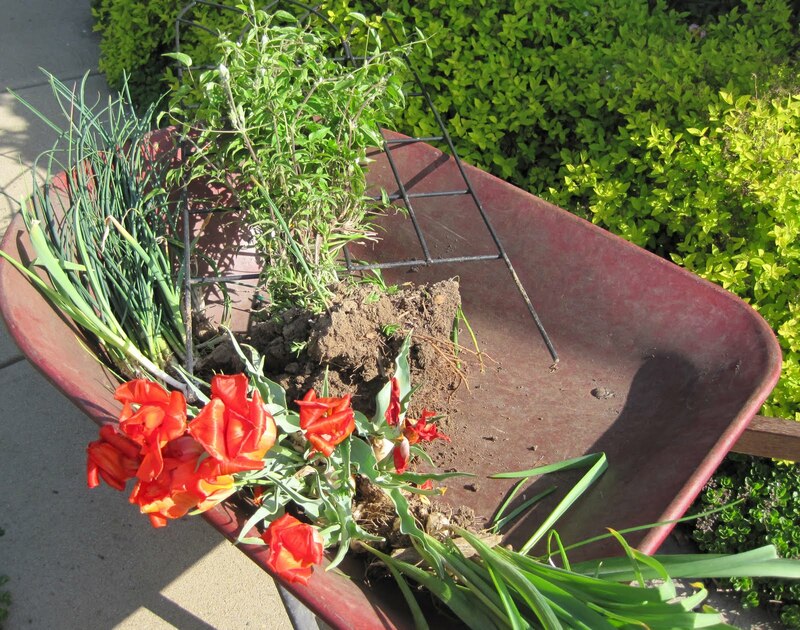 If you are moving plants because you just need them out of the way because of a new garden design, move them to one of the raised beds in the vegetable garden which you’ve turned into a “holding nursery”, even though you told the garden designer there was no way you could do that. But once you started to move plants and realized every other place was likely to be dug up, it just made sense to use part of the vegetable garden as a plant nursery. Or if they are shade loving plants, like hostas, and you have limited amounts of shade, load them up in the truck and take them to your sister’s shady yard after making her promise that you can come back and dig them up and divide them and take some back later. Can I move them? I don’t know, can you? With the right equipment, most plants can be moved. If you are moving plants because of a new garden design, “can you move them” isn’t really the question anymore. Just move the small stuff yourself and let the crew dig up and move the big shrubs. Should I divide the plants when I move them? Well, of course you should divide the plants when you move them, if they are the type that can be divided. Then you will have more for your own garden and some to share with others. Or if you are moving plants because of a new garden design, and you don’t necessarily need more plants right now, find someone, anyone, who will take the extras off your hands. What if I kill the plants by moving them? Ask yourself if the plants would be better where they are or better in a new location. Then start digging according to the answer. Yes, moving plants might set them back a bit, but with proper care, they should survive the move and might even do better in their new locations. Just be sure to get as much of the roots as you can, and cut back some of the foliage when you replant. In no time at all, the plants should recover and put down roots in the new location. Or consider that you really have no choice because you’ve already made the choice to re-do all of your garden with a new design. Plants must be moved, and this is the weekend to do it. Now, if you’ll excuse me, I have some plants to move, including some hostas to dig up and take to my sister’s garden. May all of your plants move happily!!! I'm an inveterate, unrepentant plant mover! I hate it when everything seems to be in the right place and I can't move stuff around! I also recently found out that this was one of my daughter's favorite gardening tasks when she was growing up, which gives it a whole new level of wonderful. I'd add more, but I have a lavender and a salad burnet that need new homes! Gotta go dig! How exciting - your new garden design is happening already. Hope you have room for all your old favorite plants. And your sister is truly lucky to get some of your hostas. Enjoy your day digging. Kakdah has been dividing plants that has filled up the pot. Then the issue where next comes in... Its almost perpetual. I love to move plants. Wish I were close enough to come over and help you, Carol. I live in Brisbane and have been an avid gardener for more than 20 years. I consider myself something of an expert on moving plants and am quite successful in that area. My friends and family love it too as they receive all kinds of interesting and beautiful potted plants as freebies, when I’m in a giving mood.